On July 13 at approximately 2:30 p.m. the Calcasieu Parish Sheriff’s Office responded to a call at a local hospital in reference to a medical emergency. When deputies arrived they learned a woman was currently undergoing emergency surgery for life threatening injuries. 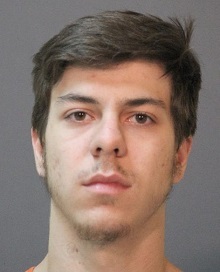 The investigation revealed the victim’s boyfriend, John R. Hodge, Jr., 19, 2532 Broussard Road, Sulphur, beat her until she was unconscious and after she regained consciousness he beat her again. After further investigation Judge Robert Wyatt signed a warrant in the amount of $200,000 for Hodge’s arrest. Hodge was located later the same evening at a local convenience store, where he was arrested and booked into the Calcasieu Correctional Center and charged with attempted second degree murder. CPSO Detective Randall Ravia is the lead investigator on this case.